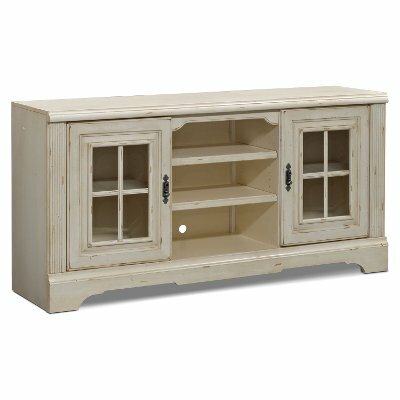 This antique white 5 piece vintage entertainment center, available at RC Willey, offers a variety of storage and display options, durable construction, and chic country charm. Its approachable design will make it a welcome addition to living spaces. When considering whether your TV will fit on this TV stand, it is important to measure the width, height, and depth of your TV. A TV's size as advertised is actually the diagonal width of the screen and doesn’t include the frame. You will need to measure the actual size to see if you will like the fit of the TV on this piece of furniture. Includes 67" TV stand, right pier, left pier, back console, and bridge. This 67 inch antique white TV stand with its frame glass windows and open storage is available now at RC Willey. Accommodating most flat panel TVs up to 70" and the cut out wire management system in the rear makes this a perfect media solution. Its durable construction and chic country charm will provide a welcome addition to your living spaces. Antique White 5 Piece Vintage Entertainment Center - Highland Manor is rated 4.4 out of 5 by 11. Rated 5 out of 5 by AuntieGee Love the look, size This entertainment center fits nicely into my new home. I have decided upon a cottage chic feel for my home, and this piece absolutely nails the feel and the look. It is more than big enough to house my large flat-screen tv, and provides ample storage for the other entertainment components. RC Willey delivery was 1. on time; they called to let me know when they would be there. I have dogs, so I needed to put them in the back yard during delivery. They called me again (per my request) so I could manage the dogs. 2. No problem putting this VERY LARGE piece of furniture together, and EXACTLY where I wanted it. Rated 2 out of 5 by Sami18 Vintage entertainment center Looked great in the store. The piece of furnitures delivered was distressed much more then the show room piece. Not a good fit for our living room decor. Rated 4 out of 5 by morganman Entertainment Center It works well. It is bolted together so if you have to move it, it won't be easy. I gave it a good, because it doesn't fit hte panel behind the TV perfectly. The apnels can be hard to put in the groves and close it. Rated 5 out of 5 by Jmanman Entertainment Center Very beautiful and elegant but very classy. It looks like it has always been there. Rated 5 out of 5 by Renomichael Excellent Quality and Value Before purchasing this entertainment center my wife and I did extensive shopping. The entertainment center is well constructed and designed. The shelves are fully adjustable and there are plenty of locations within which to route wiring. I especially liked the sliding rear doors behind the TV location. Rated 5 out of 5 by Mrvegas818 Perfect for my Livingroom my Entertainment Center was just what i was looking for. Rated 3 out of 5 by Sharebear The entertainment center is exactly what I was looking for. I enjoy my new entertainment center. My husband installed undercabinet lighting and wood planks on the back and the piece turned out great. Rated 5 out of 5 by Masmom Love this wall unit I looked everywhere for a white entertainment center and fell in love with this one as soon as I seen it. It looks great in our living room with vaulted ceilings. I was worried because of it's size that it would make our room look smaller but it was the opposite. The color makes our room look bigger and brighter. So happy with my purchase! Rated 4 out of 5 by ChurchMan Works great for just about any color combination We really like this entertainment center. It facilitates just about all electronics that I need to hook up, as well as decorative accents. My only complaints are: a) The unit (which was assembled at our home by RC Willey) leans forward quite a bit--about 2 to 3 inches more forward than the base b) Not all areas of the unit facilitate wiring very well. Placing speakers on any of the side shelves would require me to drill through the walls of the unit. There is a very small hole in the top shelf of the unit, but unfortunately even that hole is too small for the speaker bar that we have, so we need to build a custom stand to place the TV on top of, so we can put the speaker bar underneath it. Other than these two issues, we really like it.